- Provide your best description of the aerial including roads, villages, railroads and golf course. The aerial is looking south to north showing South Farmingdale, Farmingdale Central Park (Bethpage), Old Bethpage and Plainview. Look closely and you can even see the Long Island Sound at the very top. 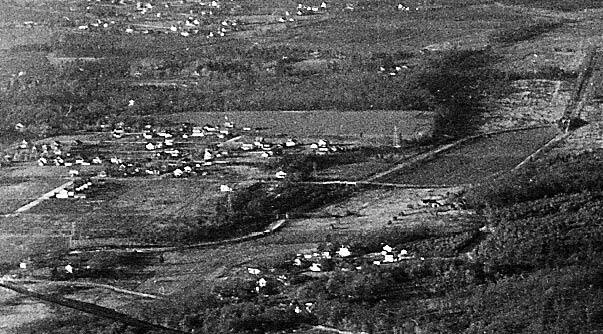 The Bethpage State Parkway can be seen under construction on the left...likely the reason for this aerial. Initially planned by Robert Moses as a parkway connecting the Southern State Parkway to Bethpage State Park, Bethpage State Parkway was opened in 1936. The parkway has a "super 2" design -- a two-lane road with no center divider -- throughout its entire length. The Motor Parkway section in Central Park can be seen in the upper left corner including the Nibbe Farmway Bridge, the Powell Avenue Bridge and the Plainview Avenue Bridge. 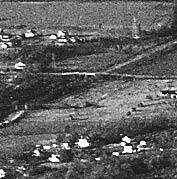 Central Park would change its name to Bethpage on October 1, 1936, less than one year after this aerial was shot. As described below in the comments, the LIRR Main Line runs east-west through the center with the Central branch going off to the southeast and the Bethpage spur branching off to the northeast.The intersection of these lines is known as the Bethpage Junction. 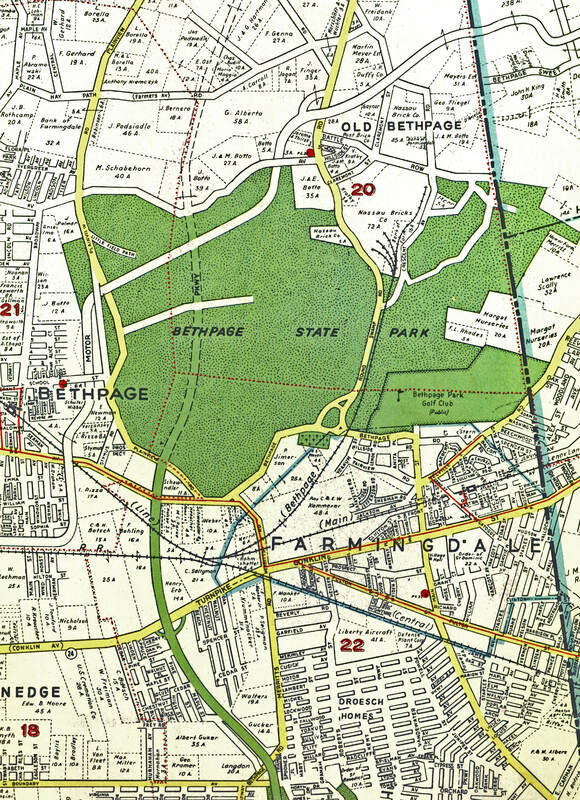 Purchased by New York State on May 18, 1934, Bethpage State Park and its famous golf course dominant the upper half of the aerial. The Black Course would open in 1936. Tiger Woods would win the 2002 U.S. Open here. Seven years later, the U.S.Open returned with Lucas Glover taking the championship. -Why is this aerial relevant to the Long Island Motor Parkway and the Vanderbilt Cup Races? 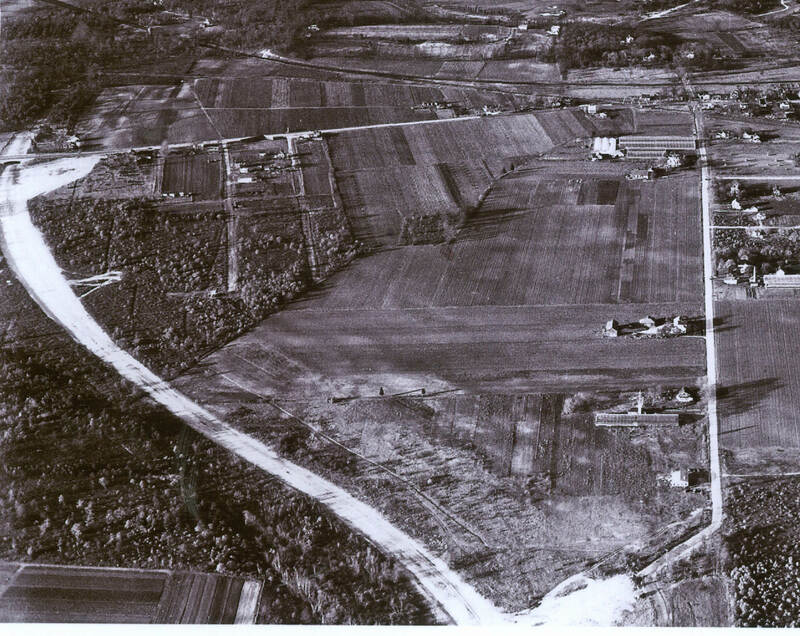 The Motor Parkway section seen in this aerial to Round Swamp Road was part of the 1908 Vanderbilt Cup Race course. Congrats to Frank Femenias, Greg O., Steve Lucas, Gene, Brian McCarthy and Art Kleiner for identifying the Bethpage State Parkway and most of the Mystery Foto key features. Kudos to Art Kleiner and Frank Femenias for their image contributions. Any supportive materials or potential Mystery Fotos can be emailed to me at Howard@Kroplick.com . Central RR is located on the lower left. Motor Parkway runs throught the middle with the Nibble Farmway Bridge and Powell Avenue Bridge clearly seen. Conklin Street (Hempstead Turnpike) is een acroos the top. Bethpage State Parkway is under construction on the left. Merritts Road is the road running north/south on the right. 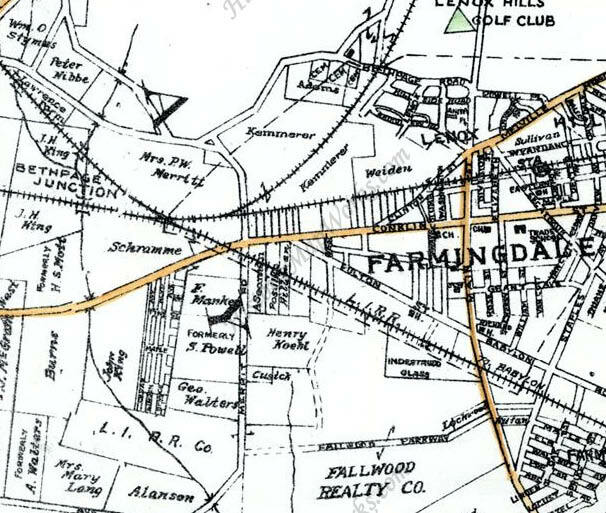 Farmingdale is seen in the lower half. The golf courses of Bethpage State Park are in the upper half. Lower left corner shows construction of Seaford Oyster Bay Expressway. The LIMP has not yet been disturbed at the 2nd Dead Man’s Curve, as the parkway enters the picture about 2/3 the way up the left side. You can see the Nibbe and Powell’s Bridge, and Plainview Rd bridge is you look hard enough at the close up, and the LILCO power lines running concurrent with the LIMP. 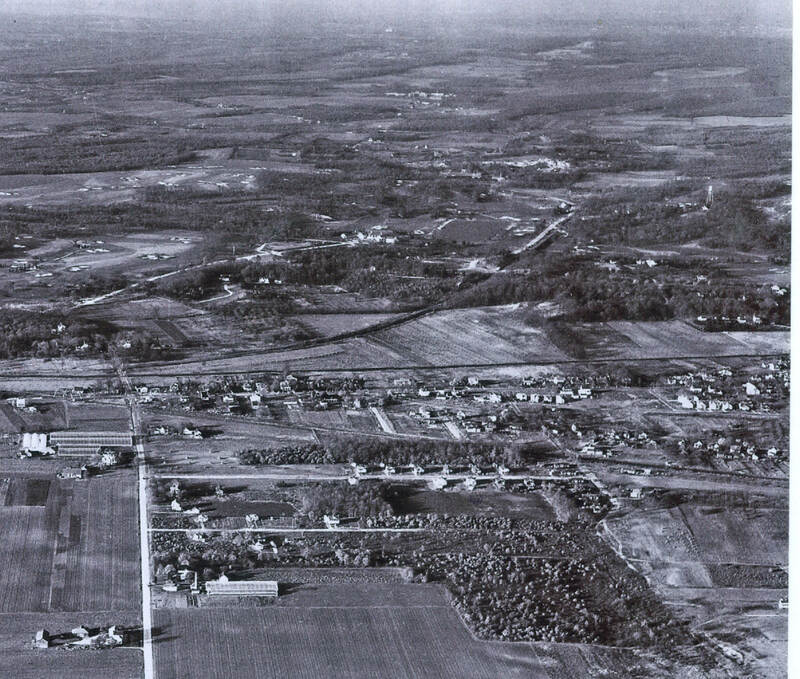 From a new perspective, an aerial of Plainedge/Farmingdale/Bethpage looking North. Bethpage State Parkway in the bottom left corner under new construction. The Bethpage Bikeway will travel alongside and merge with the Long Island Motor Pkwy just north of the Bethpage Golf Course on top. Route 24, Hempstead Tpke (Conklin St) is crossing the bridge on the left edge over the BSP. Merritts Rd in the center. LIRR approaching the Central Ave LIMP Bridge, which is off the aerial on the left edge. This place has changed much throughout the past 80 years. At street level, it would be unrecognizable today. You were right, I’m liking the aerial mystery foto this week! The position is over South Farmingdale looking North. Bethpage (Central Park) in the upper left and Farmingdale on the right. Some of the roads pictured are; the Bethpage St. Pkwy under construction bottom left, Hempstead Tpke and it’s new bridge over the BSP, Fulton St., Merritts Rd vertically in the center. 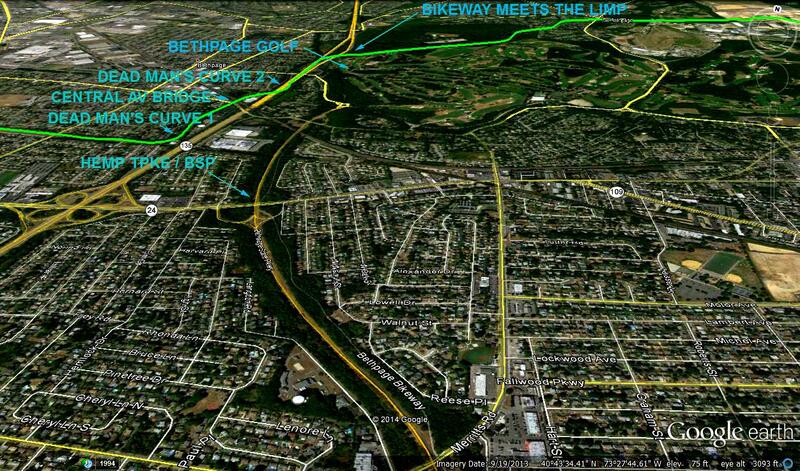 One of the nicest sections of the LIMP in Bethpage are in the upper left. In the center of the photo is the convergence of the central and main railroad lines with the Bethpage State Park golf course just behind that. I’ll assume the photo is relevant to the VCR due to the LIMP section seen between just about Central Ave to Plainview Rd was used during the 1908 races. This photo looks like a view of the Farmingdale / Bethpage area looking north. Bethpage Parkway is under construction in the lower left area. Merrit Road runs north-south in the center. The LIRR Main Line runs east-west through the center with the Central branch going off to the southeast and the Bethpage spur branching off to the northeast. The Hempstead Turnpike (Conklin Ave.) bridge over Bethpage Parkway appears to be completed at the left edge. I assume that’s Bethpage Golf Course at the top. While difficult to see, the LIMP is in the upper left area and this section was used in the 1908 Vanderbilt Cup Race. That is South Farmingdale looking north to Farmingdale and also Bethpage to the far left. The prominent, wide roadway on the left is the Bethpage Parkway from the intersection of Merritt Road (the roadway running straight up in the center) extending to Hempstead Turnpike. Bethpage State Park is seen in the distance, as can a bit of the Motor Parkway at Deadman’s Curve. There’s quite a bit of action in this aerial. We’re looking north at Bethpage and Farmingdale. 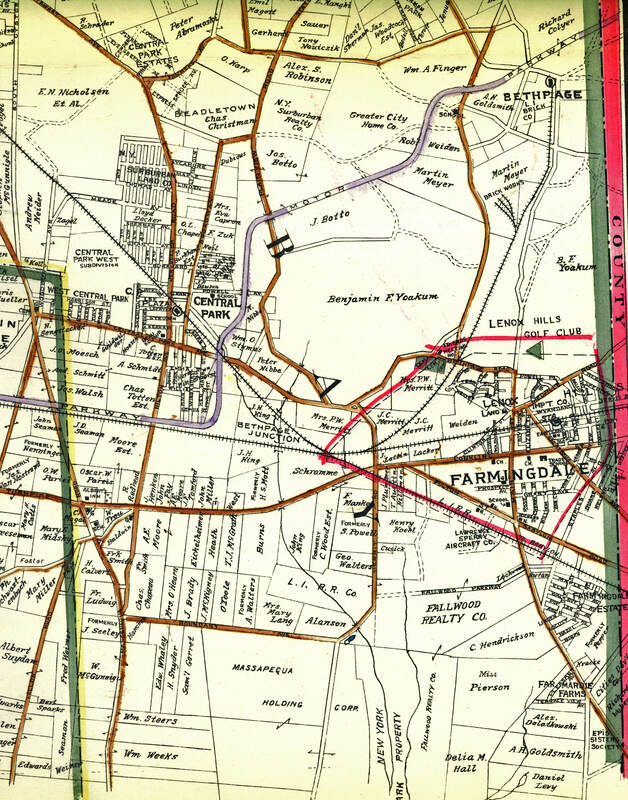 The importance of the LIMP and the 1908 VCR would be the portion of the LIMP that is seen from Central Ave north to Plainview Rd, which was constructed in time for the 1908 race. 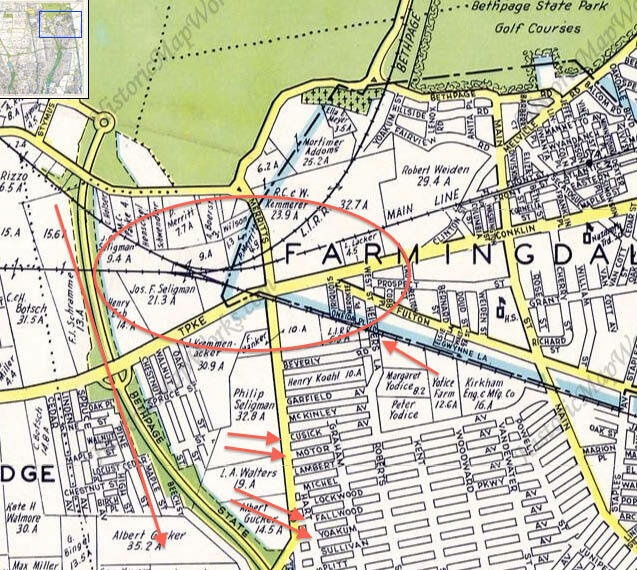 The raillines seen are the mainline, the Central ROW is evident enough, the Central Ext east of Merrits Rd is clear( pretty sure that’s the framework for the future trestle over Hempstead Tpke and Merrits) Also, the siding that ran north to the brickyard is evident. BSPkwy is being built. Then we have Hempstead Tpke, Merrits Rd, and Rte 109 ; I think. You can see Merrits joining Central Ave and Quaker Meeting House Rd, then north to Round Swamp Rd. Last,but not least; Bethpage State Park and Golf Course. In regard to my answers to the latest mystery photo, I could be wrong about the “framework” that looks to be extending over the Central Ext and Hempstead Tpke. It seems to be a trestle under construction? Whatever it is, it looks impressive. Too tired this weekend to do more investigating than this. Location analysis done with the help of historicmapworks.com (will send documentation to Howard). 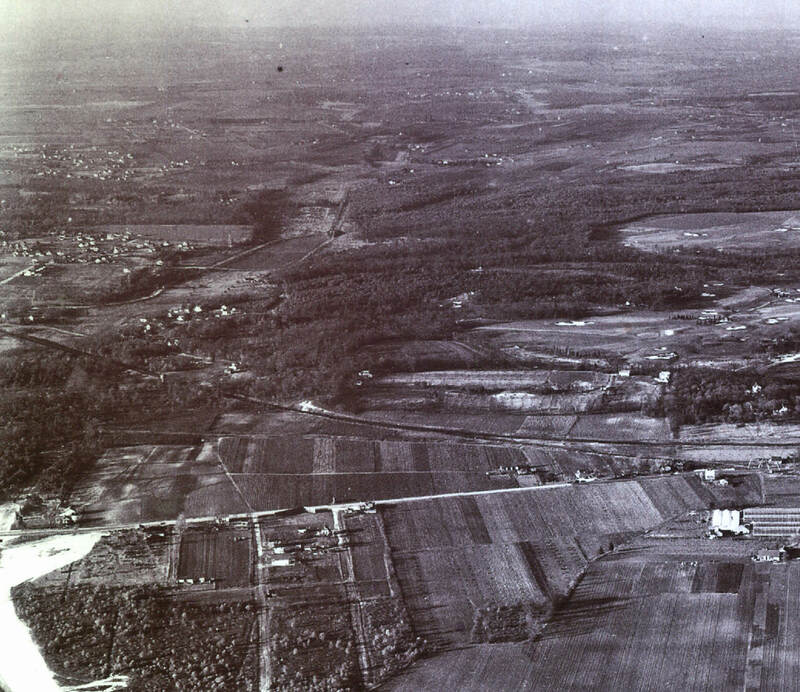 Construction of Bethpage Parkway is shown on the left of the photo. At the bottom it meets Merritts Road that turns up in the middle of the photo. The Parkway meets Hempstead/Bethpage Turnpike at the top where it ends (at least at that time). Streets going out from Merritts may be Yoakum or Fallwood Parkway, also Cusick or even Motor Avenue which intersect with Heissers Lane. Merritts also meets Fulton and Conklin (the latter actually another name for Hempstead/Bethpage Turnpike). Railroads running from left to right and somewhat to the top of the photo would be the LIRR Main Line and the Central Railroad. The intersection these lines was called the Bethpage Junction. Golf Course would be the Bethpage courses that opened in 1932 and 1935. 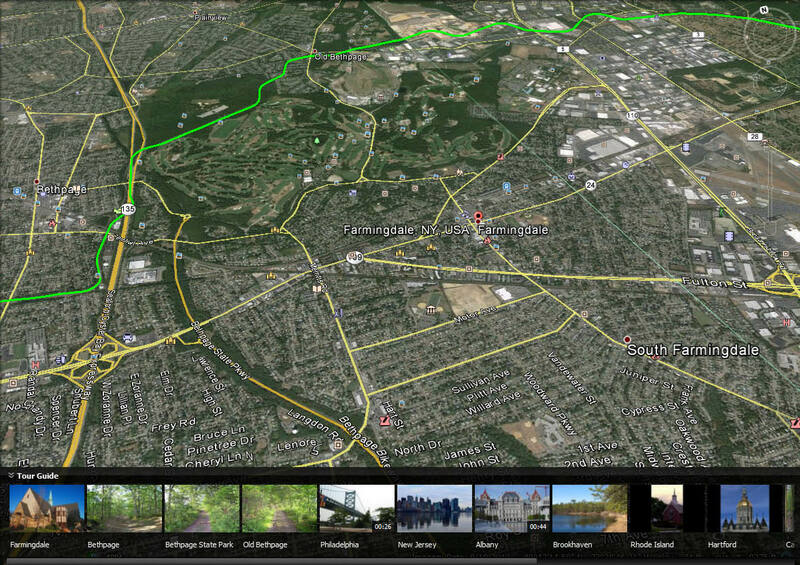 Villages include Central Park on the left most part of the photo above the end of the Bethpage Parkway, Bethpage and Farmingdale in the middle of the photo just below the train lines. Significance to the Motor Parkway would be the Powell Avenue Bridge and Nibbe Farm Bridge and the Bethpage Lodge (probably more too). I imagine the Vanderbilt Race would have run on some of the parkway in this area.